Enjoy the web's lowest price when you order your 1 oz 2008 Royal Canadian Mint 99999 gold coin from our stores today. 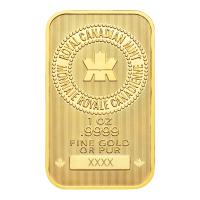 99999 Gold is the highest achievement in gold purity on the bullion market to date and is, as such, a great source of pride for the Royal Canadian Mint. 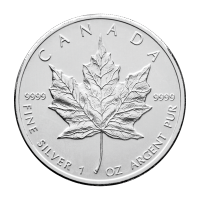 The coin's reverse features a unique dual maple leaf design, the fluid, stylized rendering in the leaves' surfaces contrasting beautifully with the intricate, mesh textured field of the coin. Partnered with the reverse reeded border, are the Canadian legend and the coin's weight and composition, along with the 99999 purity marker, which sets this coin series apart. 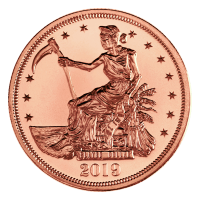 This coin's unprecedented purity is hardly the only reason for its being so sought after...it also enjoys an incredibly low mintage of just 27,476 impeccable coins. Share in this unique investment opportunity and diversify your portfolio with a 1 oz 2008 Royal Canadian Mint 99999 gold coin today. 앞면 Effigy of Queen Elizabeth II and the words "Elizabeth II 50 Dollars 2008"
뒷면 Two maple leaves extending from a branch along with the coins weight and 99999 purity stamp crowned with the 'Canada' title. Effigy of Queen Elizabeth II and the words "Elizabeth II 50 Dollars 2008"
Two maple leaves extending from a branch along with the coins weight and 99999 purity stamp crowned with the 'Canada' title. 1 oz 2008 Royal Canadian Mint 99999 Gold Coin Enjoy the web's lowest price when you order your 1 oz 2008 Royal Canadian Mint 99999 gold coin from our stores today. 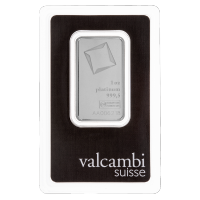 99999 Gold is the highest achievement in gold purity on the bullion market to date and is, as such, a great source of pride for the Royal Canadian Mint. 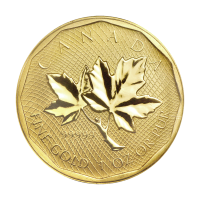 The coin's reverse features a unique dual maple leaf design, the fluid, stylized rendering in the leaves' surfaces contrasting beautifully with the intricate, mesh textured field of the coin. 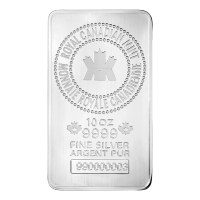 Partnered with the reverse reeded border, are the Canadian legend and the coin's weight and composition, along with the 99999 purity marker, which sets this coin series apart. The obverse of the coin bears an effigy of Elizabeth II in profile, courtesy of skilled artist, Susanna Blunt; this image is given added dimension by the inclusion of the same, intricate meshed field design we saw on the reverse. 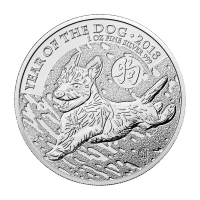 Also on the obverse, Elizabeth II's name, as well as the coin's particularly high face value and its year of issue This coin's unprecedented purity is hardly the only reason for its being so sought after...it also enjoys an incredibly low mintage of just 27,476 impeccable coins. 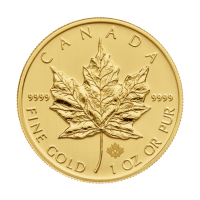 Share in this unique investment opportunity and diversify your portfolio with a 1 oz 2008 Royal Canadian Mint 99999 gold coin today.